Published by Bill Gaultiere on January 1st, 2016 (fully updated edition). 232 pages. With the help of Dallas Willard who personally mentored him, Bill Gaultiere became Jesus’ apprentice and learned how to live and minister to others in God’s peace and power. With real life stories, fresh Biblical insights, and practical steps he invites you to enjoy Your Best Life in Jesus’ Easy Yoke. Bill Gaultiere, Ph.D. is a psychologist and spiritual director. By the age of 30 he had published three books with mainline Christian publishers and sold over 40,000 copies. Bill and his wife Kristi have their doctorates in psychology and are the founders of Soul Shepherding, Inc., a nonprofit ministry that cultivates intimacy with Jesus for pastors and other servant leaders. Their website receives one million page views per year. Inspiring stories of people overcoming their stress and growing spiritually. Short surveys to identify needs for help with stress, anxiety, self-esteem, hurrying, and more. Fresh insights from the Bible, especially on the life of Jesus for you. Diagrams illustrating the way to life change and peace. Scripture meditations, Breath Prayers, and other spiritual disciplines. Soul talk questions to share with a friend or small group. Two suggested outlines for Easy Yoke sermon series or small groups. Start an “Easy Yoke Group” at Your Church! What inspired you to write Your Best Life In Jesus’ Easy Yoke? Relaxed! That’s what I needed! I wasn’t very relaxed in my life and ministry! 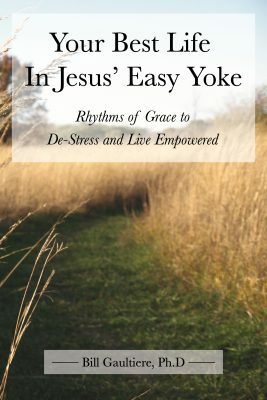 So I began to study, meditate, and practice being in Jesus’ easy yoke — his rhythms of grace — and I was amazed to see how I grew in God’s peace and power. I’ve been living and sharing this message for over ten years. Anyone who is seeking to grow in their relationship with Christ in the midst of their real life challenges and hurts. I especially want to encourage pastors and leaders in their spiritual life and to give them a tool for their preaching, small groups, and developing leaders who are authentic apprentices of Christ. I love the book’s many up close and personal looks at Jesus and his relationship with the Father. Watching him live in the easy yoke of Abba is so inspiring! This is what he shares with us! For instance, in the new edition I wrote a whole section on Jesus called “Just a Tekton.” It’s about Jesus’ hidden years in Nazareth as a carpenter or stonecutter. We all have ordinary work to do and feel hidden or insignificant at times and Jesus shows us how to deal with this. Why would someone buy this book? There are two overwhelming blessings you’ll experience: (1) You’ll be drawn into greater intimacy with Christ Jesus and (2) You’ll discover how apprenticeship to Christ can help you with stress, anxiety, hurry, people-pleasing, fear, and over-working. How is this updated version published in 2016 different from the first one? The whole book is updated and improved, including a new chapter on apprenticeship to Jesus and another on “Fear not.” The 2010 version (called You Can Live In Jesus’ Easy Yoke) wasn’t written as a book for the public — it was a curriculum for two groups of pastors that I was caring for and so that these men and women could then lead “Easy Yoke Groups” with others. Later we decided to offer it for sale because the content was so good. What is your prayer for this book? I pray that readers will be affected by the Easy Yoke Gospel of Christ like I was. It launched me into a great spiritual renewal in 2003! I learned how to live my whole life with Jesus in the Kingdom of God. I pray that people will be so revitalized by this message and the practical Scripture mediations and prayers that they’ll invite others to join them on an Easy Yoke journey as a group, triad, or soul friendship.